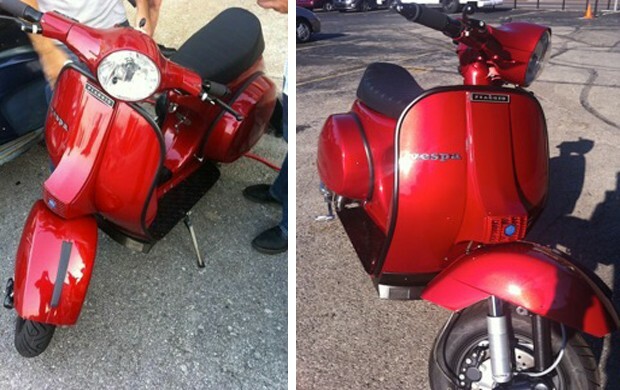 Mike Taylor, the Majordomo at Taylorspeed in St. Louis, Mo, got out the toolkit and did a full restoration (with the help of English Tooth Racing) of this amazing Vespa which puts out a startling 30hp. So how do you get that kind of juice out of a tiny Italian motor? You include a little nitrous. 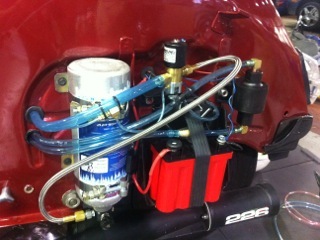 That’s right, a nitrous-enhanced Vespa. To put that into perspective, a brand new Royal Enfield Bullet 500 makes only 27 hp, and weighs nearly 200 lbs more than a Vespa P200. So without a doubt, this little bike should haul! Word is, Mike and his crew are working on a 40 hp motor next. We’ve seen paper craft Vespa models before, but none with the detail of this stunning “Roman Holiday”-inspired 1952 Faro Basso.